I love free point offers and there are two quick & easy opportunities right now to earn 500 to 750 FlexPerks points. I know many of you recently applied for the US Bank FlexPerks Visa with the increased signup bonus of 34,500 points due to their Olympics promotion in which the signup bonus was tied to Team USA’s performance in Rio so these free points offers are quite timely. 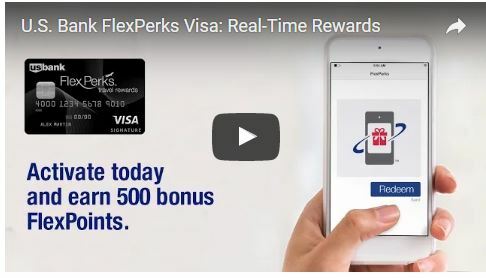 One of the features of the FlexPerks program is the ability to redeem rewards instantly right after a purchase and right now you can earn 500 points for simply enrolling in this program. You do not have to make a redemption to earn the 500 points. Of course, I would never recommend redeeming points this way but I don’t mind an easy 500 points for signing up. Here is a direct link to the landing page with more detailed instructions about the offer and Real-Time Rewards. Alternatively you can access this offer by logging into your account, going to the Rewards section and looking for the Offers tab towards the top of the page. You simply need to click the link below and see if you are eligible for the offer as occasionally FlexPerks will run promotions on their promotions site for various bonus point offers. The initial landing page does not show the offer but it should be available once you fill in the information. Here is the direct link to the offer. This is not working for everyone so this must be targeted (hence the YMMV title on the offer) but worth the 10 seconds to check. I took advantage of these offers as I hope to get my FlexPerks balance for my wife and I at the 40,000 point level so I can redeem them for airline tickets up to $800. The signup bonus and minimum spend will count for 36,500 points of those points and these offers bring us over 37,000 points each so this was a no-brainer for us to each try.